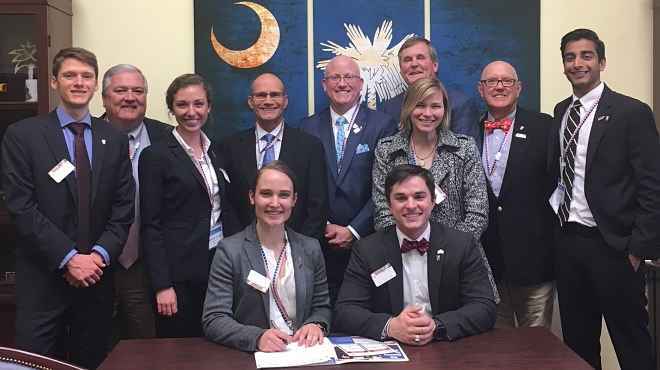 South Carolina dentists and MUSC dental students joined 1,100 dental professionals in Washington to address national dental health issues. The South Carolina Dental Association asked me to join this group. We met with Congress members from our districts. Our goal: Communicate to national leaders how to best serve dentists and their patients. I enjoyed hanging out with bright, enthusiastic dental students. The students above are standing outside Senator Tim Scott’s office. I am the young guy hiding behind the South Carolina state flag. The ADA (American Dental Association) and ASDA (American Student Dental Association) are committed to fighting opioid abuse. This opioid crisis is devastating our communities. We asked Congress members to pass legislation limiting the number of days dentists can prescribe pain medications following dental procedures. The ADA policy on opioids calls for education of dentists and prescription monitoring programs. We already follow these policies in South Carolina. The SC Board of Dentistry requires at least 2 hours of education on addictions every 2 years. Dentists check SCRIPTS, the state’s data base of drug prescriptions, before writing opioid prescriptions. I am proud of what we do in South Carolina to limit opioid prescriptions. I never want a patient in our state to become an addict after visiting a dental office. We asked the Senate to amend the the McCarran-Ferguson Act to repeal the antitrust exemption for health insurance companies.The House passed H.R. 372 with a 416-7 margin. The ADA asked Senate members to join the House in this passing this antitrust bill. This legislation will lead to competition and transparency for dental providers and patients. Antitrust laws promote lower prices, greater consumer choice, and innovation through competition. I believe that we should hold health insurance companies to the same antitrust laws that govern other businesses. 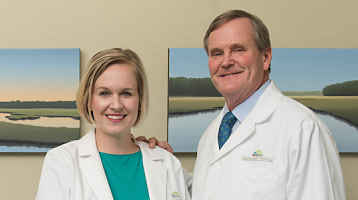 This will help dental patients in SC obtain better dental plans. This Act calls for federal grant money to be used to give the greatest possible help to dental outreach programs that improve dental health and access to care. 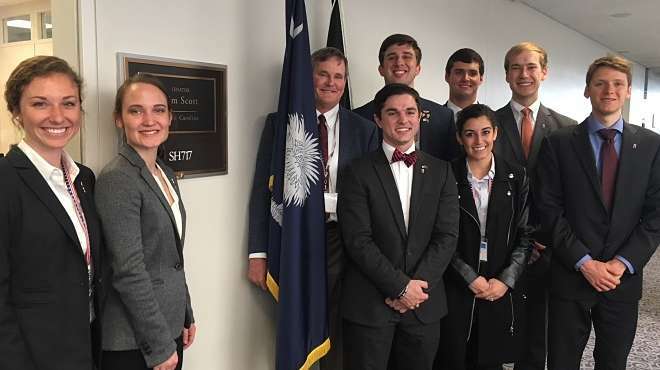 Having seen the impact of Dental Access Days in South Carolina, I support allowing volunteer programs to qualify for existing oral health funds. 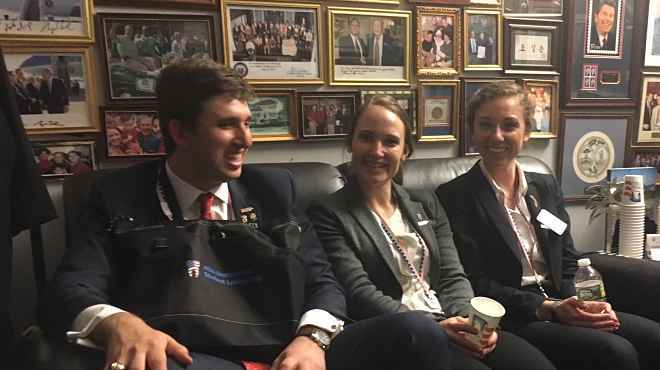 We asked our Congress members to keep programs that help dental students graduate with manageable student loan payments. The average debt is close to $300,000 per student. I know from experience that young dentists need to be free to establish practices in local communities. This is nearly impossible to do when they graduate with a heavy debt load. I support legislation which will assure that dental schools attract and educate the best possible future dentists. The dental students who joined us in Washington were sharp and engaged. This legislative trip was a great learning experience for these future dentists. It is important to communicate with our elected representatives. They really want to hear from us. How can they help our professions and communities if we do not tell them what we need? I enjoyed being part of the political process. I am confident that participating in it helped our patients and dentists in our home states. I hope I helped my patients in Rock Hill, South Carolina. I appreciate the training the American Dental Association gave the students and dentists. The ADA taught us how to work with our leaders in Washington. They provided helpful training sessions and printed materials. They mixed in a little social time. I proudly wore my orange Clemson tiger paw to the Team Party. What a great event! The South Carolina delegation enjoyed coming together in Washington. We were happy to represent our patients and profession. Many thanks to the American Dental Association. Great job! Contact Dr. Bill Cranford at Cranford Dental if you would like to discuss dental legislation or dental ethics. He would be happy to share his expertise about his profession. Call Cranford Dental at 803-324-7670 or CONTACT CRANFORD DENTAL ONLINE to make an appointment to discuss your dental needs.